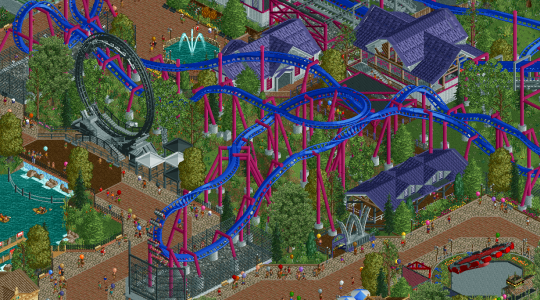 It's time for another round of voting for RCTgo's Build It! Competition. Four more great entries are up for voting - below are the name and screenshot of each. It's now time for you to vote for your favorite track! Let's have a great round! At first glance it looks like Scoop and Hurricane are the two contenders in this round (because the other two are clearly unfinished in comparison), I'll be back with CC sometime tomorrow. Tough Decision. Have to pick a favorite based off the build it standards. If I were going purely off taste though I would probably pick scoop, but thats liable to change. Blazing I really love your foliage. Scoop looks really good too, but felt a bit boring to me. Hard decision though. Scoop: Great entry, but your lack of screens kills it. I have no idea what all is happening because there is no good overview of the whole ride. Layout wise, from what I can tell, looks good. Iron Blossom: This needs work. Please just look at some previous RCT winners before you enter. 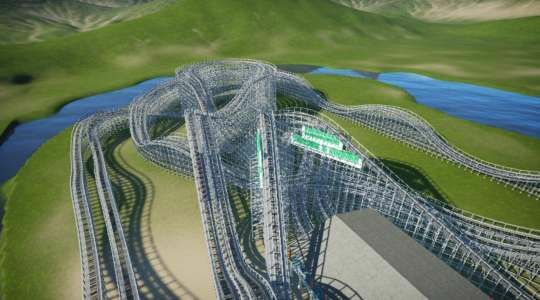 Cyclone Racer: While I am glad to see another planco entry, it also needs work. Even just some foliage would help. Hurricane: My Vote goes here. I have no complaints at all. Scoop - From the looks of it this is yet another fantastic ORCT2 project, unfortunately there aren't enough screenshots to really judge the ride though. What is here is fantastic, but there isn't enough of it to make me vote for it. Expert work with the supports and other ride-related object placement, great work on the CFR's (especially the Meteorite, probably the best I've seen yet), and the layout looks very clean. My only gripe other than the lack of screens is that one footer appears to have been placed squarely within the queue line of the ride. Iron Blossom - While I appreciate the attempt at entering, this isn't quite what we've come to expect as Build-It! quality. Study real layouts to understand how they work, (it'll help with your support work too) and work on your terraforming/scenery skills. Scattering a few pines around a ride won't get you credit for theming the ride. Studying past winners is generally a good way to learn as well. Cyclone Racer - I could basically copy and paste most of my points for Iron Blossom again down here and they'd ring just as true. Study past winners, add context to your project so it isn't in a vast empty plain, include scenery and work on landscaping, etc. Also, be sure to include much more than just one screen in the future. No one can download your ride until the competition is over (at least not on-site, if someone really wanted to they could track this down on the workshop like I did though). After viewing the ride in game I'm less impressed. Your station is incomplete, and while it would have taken considerable effort to try and recreate it accurately and can be done well if attempted. The layout itself appears to be made at far too large of a scale as well. Hurricane - Likely this round's winner simply for the fact that the others really can't compete (because they either aren't done or we can't see them). With that being said I don't mean to take anything away from this solid Eurofighter, it is a great entry in its own right, the lack of competition never hurts though. It's honestly hard to judge any of these entries by build it standards. To be honest I'm not sure which way to vote. Cyclone Racer: I see a good looking wooden coaster but having not ridden the real thing one I'm not sure how to judge a recreation. And the fact that it lacks foliage and landscaping is a real turn off. This is not what I expected from a planet coaster entry. And besides I'm pretty sure the rules state that just a track alone is not even qualified to enter build it to begin with. 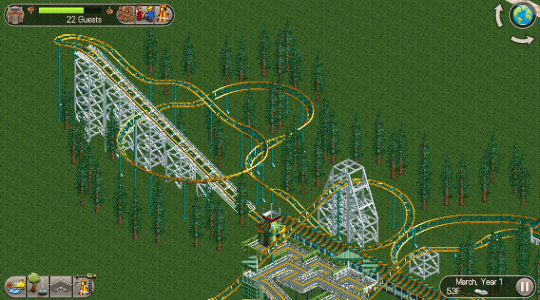 Iorn Blossom: A junior coaster that seems to lack in scenery as many people are saying. The layout is good though. Scoop: a funny name for a B&M inverted coaster but a great layout and a great amount of scenery. Plus I like how the color scheme is similar to Banshee from Kings Island. Just provide more screenshots in the future. Hurricane: while the track and car types don't exactly look like a eurofighter the layout itself is excellent. Of course rct2 has its limits and so far no one has made a real eurofighter ctr for the game. Anna, i think the reason Justin let that one get in this time was due to the lack of entries into this round. 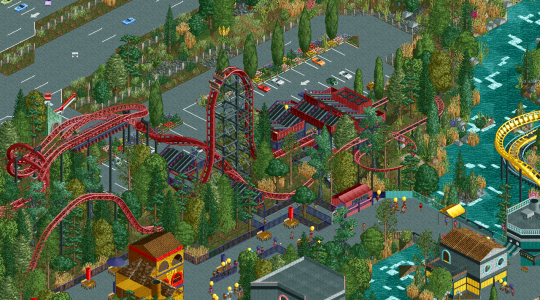 There actually is a Gerstlauer Eurofighter CTR for RCT2 (OpenRCT2), and I can tell it is used here. There's two clear entries, and the other ones could use a good bit of work, but I couldn't decide between Scoop and Hurricane. Good luck, may there be a crowned winner!